The receiving party of the call you have which is mediated via Google Chrome will not hear you. All websites that may require recording will not hear any feedback coming from your microphone. Voice activated activities may not work. Click ‘Chrome’ which is located at the top left portion of the screen. 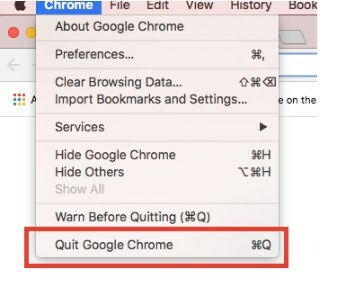 Proceed to the bottom most option which says ‘Quit Google Chrome’. Click the option and Google Chrome will close itself entirely. Re-launch Google Chrome by opening the app via its Shortcut or App Dock. Proceed to the ‘Task Bar’ and locate the Google Chrome Icon or Window Tray. Left Click using your mouse the ‘Google Chrome’ Icon and a menu will appear. Find the option that says ‘Close all window(s)’. All opened Google Chrome windows and tab will automatically close after clicking. Re-launch Google Chrome by right-clicking the Icon in your Taskbar or your Desktop Shortcut.